Susan from Must Love Junk, and myself wanted to do a regular feature on our blogs, something unique that hasn't been done before. So we came up with an idea to 'spotlight the real life behind the blogger' in a more personal way. Happy Saturday. This Saturday in Spotlight I would love to introduce you to Su from Butterfly and Bungalow. 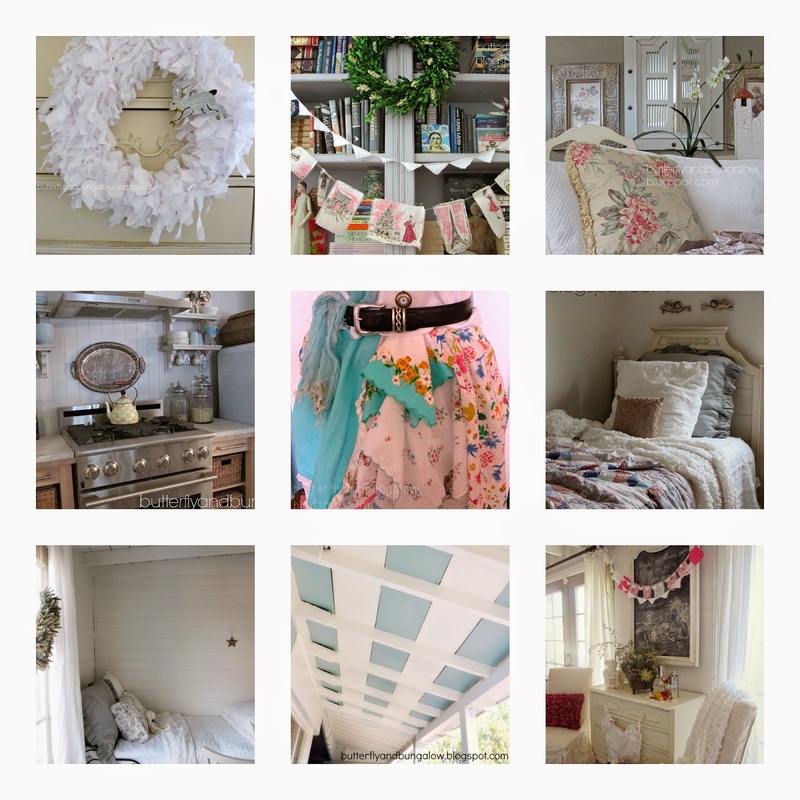 I have followed Su for a little over a year and love all the beautiful decor changes she has done on her lovely cottage. My fav room being her Sleeping Porch. Just Awesome! Enjoy getting to know Su on a more personal level and then hop over to see her blog if you are not already a follower. Thank you, Kris for inviting me, and it's honor to be part of Life Behind the Blogger. 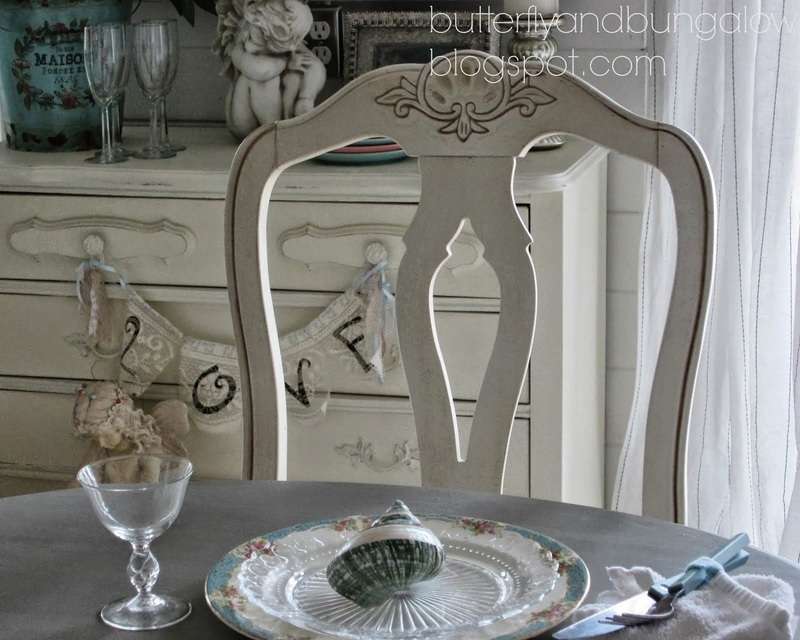 Hi, I'm Su, and I've been blogging at Butterfly and Bungalow for twenty two months. I began when we started remodeling our seventy-years old cottage. My husband and I have done most all of the work ourselves except for the major electricity and plumbing fix. Considering the disrepair of this home and garden when I began blogging, we have accomplished quite a bit to make it sweet in a short time. My favorite rooms are the kitchen and bathroom, but for many of my readers it is the Mad Hatter Library and the sleeping porch. 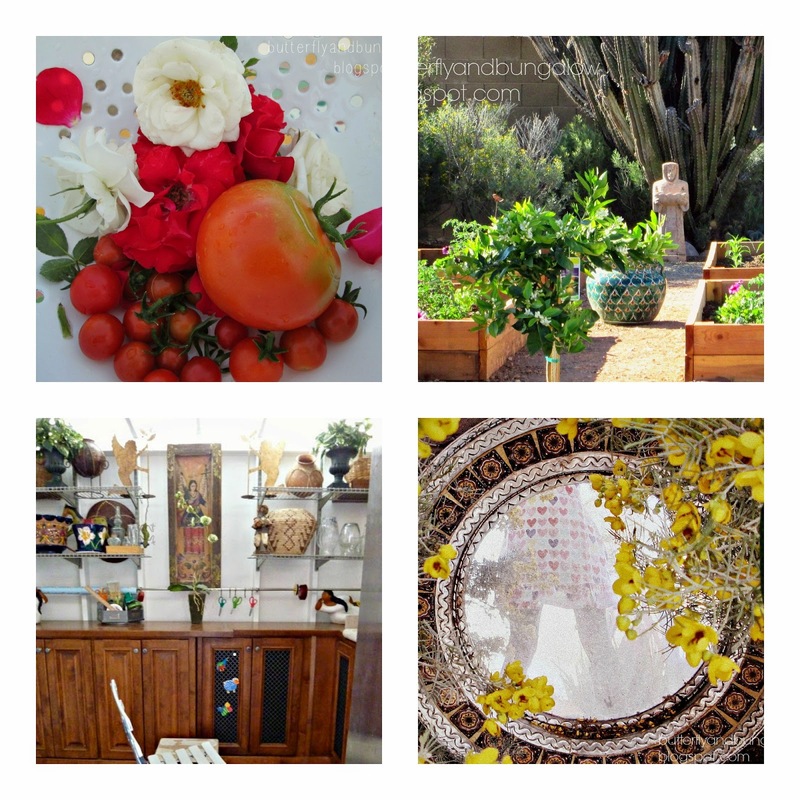 This home was a downsize from a much larger home, but like many folks, we made changes in this economy, and now, we are adapting to living smaller and learning to garden in the desert. Moving from a newer, large home to an old, small home, taught me to love imperfection. Nothing is perfect in a small, old house for example, some walls are wider at the bottom then the top, and clutter is easy to accumulate. The great thing about an older home is that if one makes a repair and it doesn't look perfect, it's okay, because it looks like it belongs! I'm also having more fun with my decorating for example, I have a blue refrigerator and stripes under the front porch's ceiling. I sometimes blog with my daughter. I love the whimsical and the sacred, and my daughter loves cats and Alice in Wonderland. 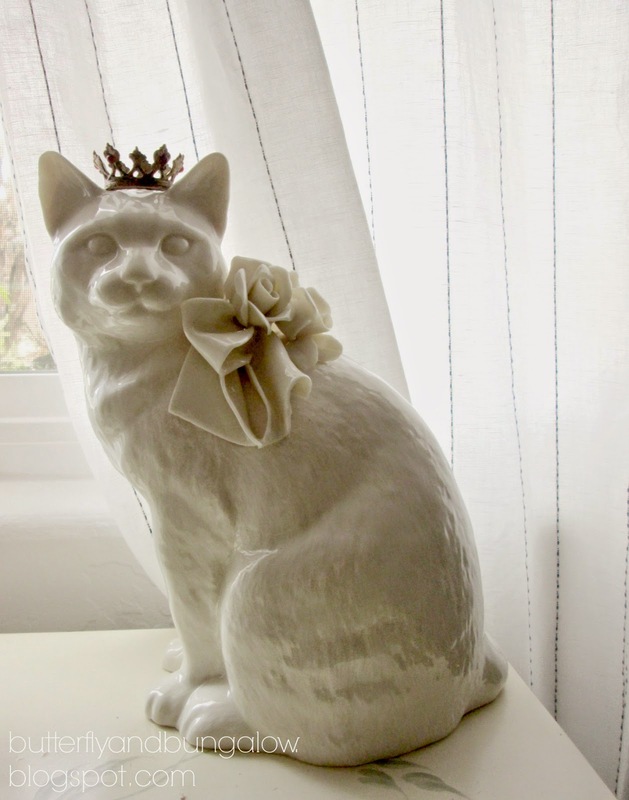 So it is not unusual for a ceramic cat to where a santos crown. We have some things in common: both our names begin with S; we both love vintage shops; we also both paint and craft. We both have had some direct or indirect successes with blogging. My daughter wrote a column for Discovery Girl Magazine and my kitchen was featured on: Apartment Therapy, Home Depot's Pinterest, and a finalist in a Cottages and Bungalows' makeover. Blogging also teaches me to be a better hostess to my friends. Blogging has also brought about some friendships. I still have one room and a shed that are outside the main house that need quite a bit of care; the room off the carport will be my spouse's office, and the shed will be a studio. But everything is on hold this year, because our family has been saving and preparing for a trip. My daughter is a classical pianist, and she was invited and accepted to study piano in the summer with some world class teachers in Europe. We were thrilled, because we always thought she would be older, but because she is thirteen and not older than sixteen, I must accompany her! So we are both excited. She is excited about meeting other young, classical pianists, and we are both excited to see old cities, gardens, and museums. This will be her first trip to Europe. My spouse of twenty-three years is a native Californian. He does almost all the handy work, and he doesn't like his picture taken. We met at the university in La Jolla, we became engaged on a trip to Paris, and we married right after graduating. I've lived all over, but I consider myself almost a native Zoner and almost a native Californian, because I've lived most of my life between both states. I was born back east, but spent summers in Canada and one in Iowa, because my father lived and worked in Canada. I also lived a year in Utah. I went to twelve schools growing up, and my favorite year in school was spent at a Catholic boarding school for girls on the Navajo reservation near New Mexico. Since I moved a lot growing up, and came from a very large family, home is really something I value and caretake. 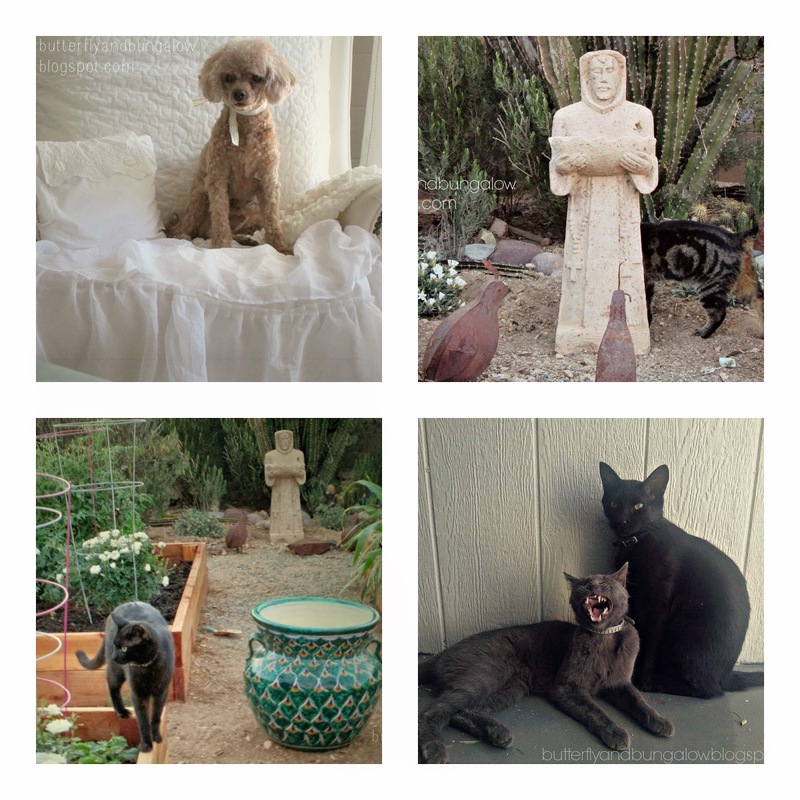 Our family also consists of a toy poodle, and three adopted, outdoor, formerly stray kitties. My blog shows a pretty and happy side of life, but I am a deep thinker, and I think you can see both sides in my decorating; I love whimsy, and I collect santos, angels, retablos, and books. My favorite saying is from Tony Hillerman's autobiography, "Blessed are those who expect little. They are seldom disappointed." Thank you Su for sharing your home and your family with all of us. Ohhhhh how wonderful that your daughter is a classical pianist and the two of you are heading to Europe this summer. You must be so proud and excited. Now that you have gotten to know more about Su please hop over to Susan's blog and meet another sweet blogger Ceekay from Thinkin of Home. Thanks for introducing us to Su. Loved her home and learning all about her and her family. I will be following her. Have a great trip and Happy Mothers Day. I'm thrilled you have this fabulous trip planned with your daughter! I'm sure it will be one of those lifetime memorable experiences. So inspiring to learn more about Su!! Kris I look forward to Saturday spotlights that you and Susan host. Su I just became a follower and plan to go back to your blog to read older posts. Oh I love this series and I love her blog and her style. So pretty. Thanks for always hosting this fun meme and I hope you have a very, very Happy Mother's Day.!!!!! Thank you, Marty. Happy Mother's Day to you too. Thank you, Kathy. Happy Mother's Day to you too! I have been following Su for a long time. Lots of talent in her family. Great feature. Su, your home is so charming and I really enjoyed getting to know more about you. What an exciting thing for your daughter! (and you!) Thanks for sharing your story. Loved getting to know Su....and love how she is embracing the imperfections of her "new" older home....Beautiful home!! su is new to me, --i"ll check out her blog. thanks for sharing, kris! Su has such wonderful style! I love everything about her home. I knew her daughter loved Alice in Wonderland but how fabulous that she is such an accomplished pianist! Talent runs ramped in that family!